A staggering 87% of employees worldwide are not engaged. Many companies are experiencing a crisis of engagement and aren't aware of it. It doesn't have to be this way. The level of employee engagement among Gallup's best clients is more than 21 times the rate of workforces globally. Gallup works with organizations of all sizes in industries including banking, hospitality, healthcare, manufacturing, retail and more to create highly engaging and high-performing cultures. We offer enterprisewide solutions for large companies, as well as online access to the same powerful engagement tools for small- to medium-sized businesses. Our science is based on 30 years of research with more than 30 million employees. Partner with the leading experts in performance management. 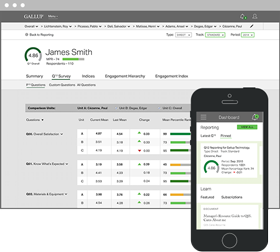 "George" -- Gallup's self-service survey and reporting engine -- is available to clients through an annual, unlimited-use subscription. It is time to move past satisfaction surveys and create a culture of development. Gallup doesn't just measure engagement; we improve workplaces. We help clients move employee engagement from a "check-the-box" activity to a crucial component of their human capital strategy. Based on decades of data, Gallup's ninth employee engagement meta-analysis data and illustrates the connections between highly engaged teams and increases in business outcomes. Unlock your organization's greatest potential through powerful, proven strategies. Align purpose, brand and culture to maximize performance. Empower employees to lead a life well-lived. Lay the groundwork for fundamental, lasting change. If you would like to learn more about creating a culture of engagement, or if you would like to request a quote, please fill out the form below.